Vår porter är bryggd på mycket kornmalt, med inslag av rostat malt samt havremalt. 7,8 % är alkoholhalten. Det är en litet stramare och torrare variant vilket gör att den passar bra till kötträtter, t.ex en klassisk Boeuf Bourguignon, samt till chokladdesserter och såklart – ostron! Vår porter skapades nämligen 2011 med tanke på den stundande Ostronfestivalen i Grebbestad. Det hela var ett samarbete mellan Bohusläns och Västergötlands Matlandsambassadörer som tröttnat på det franska bubbel som ständigt serverades till fina svenska ostron. Voilà – här har ni en långt mer spännande kombination! UPDATED: FEB 1, 2019 Bottle. Clear, dark amber body with a medium sized, dense beige head. Aroma has dark malt, smooth roasted,, dry fruit. Flavor is pleasant, smooth roasted, sweet, dark malt, coffee and moderate bitterness. Fine balanced body, good balance all over and pleasant aftertaste. 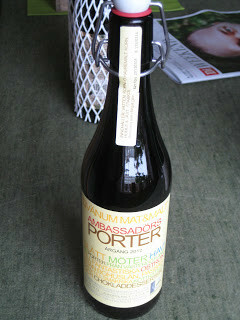 A really nice, pretty classic porter. UPDATED: DEC 2, 2018 KØLF 021118. Dark brown color with a tan head. Aroma is roasted malt, coffee, chocolate. Flavor is roasted malt, coffee, chocolate, grain, dried fruits. Medium to full body. Nice beer. UPDATED: AUG 28, 2018 Nose with pumpernickel and malty notes. Very dark red almost black. Taste is some coffee and still bread with some fruity notes. Dark dry fruits and some plums. Palate more than medium and light viscosity. Backlog. Bottle at Ölstugan Tullen Lejonet, Göteborg. Dark brown with off white head. Malty with bisquits, coffee and chocolate. Light roasted tones. Many thanks to Nisse666 for this bottle. Fantastic smooth malty beginning. Refreshing, round and malty, moderate bitter, refreshing, mild and smooth. Moderate bitter in the end, round and smooth. Nice. 33cl bottle @ hotel in Skara. Poured cola brown in color with a thin brown head. Chocolate, roasted malt, molasses in aroma. Quite smooth, dark bread, chocolate, roasted malt and molasses in flavor. Long bready finish. Tasty, easy drinkin porter. This fruity, earthy and lightly acidic Robust Porter has a lot to offer, but ends being a tad puzzling in its flavour deployment. -A sizeable head of foam settles atop the brownish black. -Green wood and hops combine in the finish. -Malts offer some toast, but mostly make way for barrel and fermentation notes. -Body is frail for what is supposed to be a potent brew. Medium brown. Thick head. On the nose this has a touch of brett and acidity, but also a fairly rich toasty note. That malt note is prominent on the palate, touch of funk. Not bad...a lighter chocolate note is really the feature here. Sving-topp flaske 500ml med litt futt. Drukket på Lillehøgda 17 Apr 17. Svart. Så vidt gjennomskinnelig. Lavt bobleskum med krem på toppen. Pen lacing. Lett sjokoladearoma. Smaken balansert. Sjokolade & lakris. Behagelig - men i søtligste laget. Bottle shared by Björn thanks. Small and fluffy brown head. Soy aroma with chocolate arom. Small caramell sweetness and fine chocolate taste. Fine body and a balanced body.